This Christmas my little girl got her very first play kitchen. We were quite careful picking one out and just as we decided to wait a year because we couldn’t find anything we liked as far as durability was concerned, we discovered the Ikea play kitchen which happened to be absolutely perfect and it suited our budget. The accessories range for the Ikea play kitchen is pretty amazing and all the food is made of fabric. When I was a child, my play kitchen was one of my most loved toys and I had a lot of accessories to go with it but they were all plastic and boring and there were never enough pieces to make anything resembling a meal which frustrated me. The fabric foods that Ikea produces are thoughtfully designed and it was the potential of fabric combined with the thoughtful designs that started the creative gears in my head spinning. 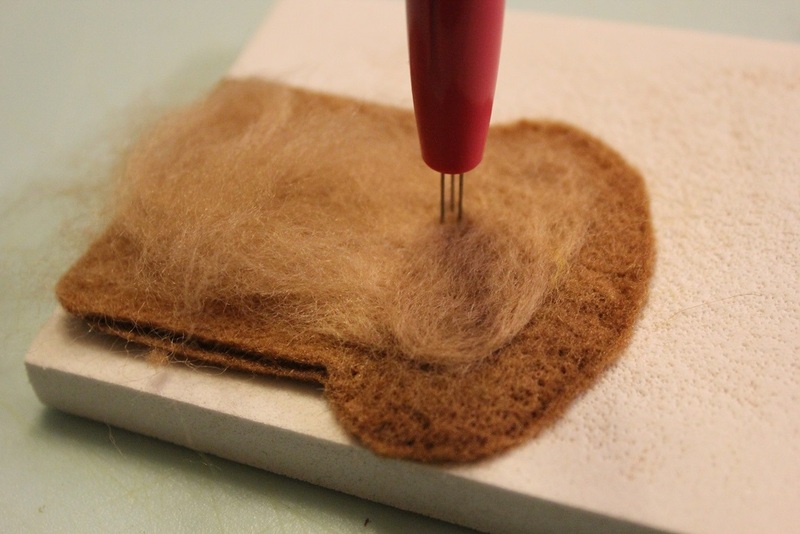 Since I have recently discovered felting I began brain storming what I could make using felt and wool in this past week since the kitchen has been in our home and the ideas just keep coming. 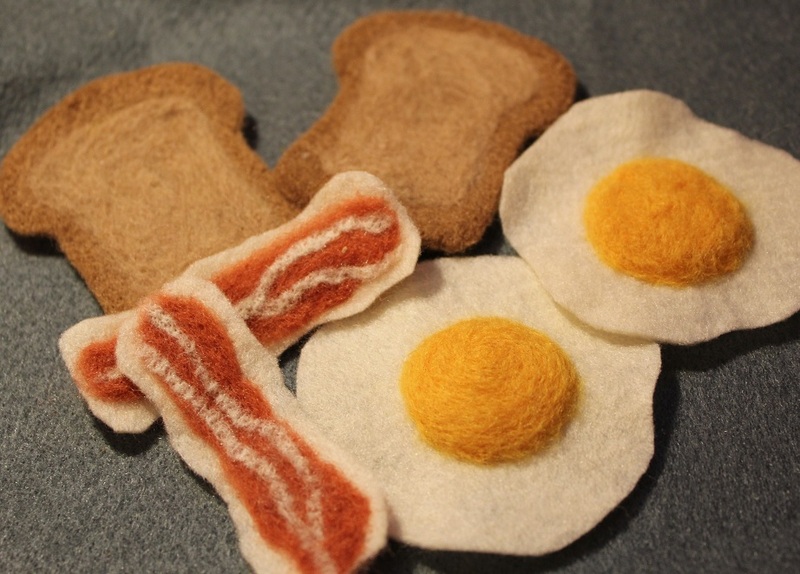 Today I got a chance to work on my first felted food project consisting of eggs, bacon and toast. 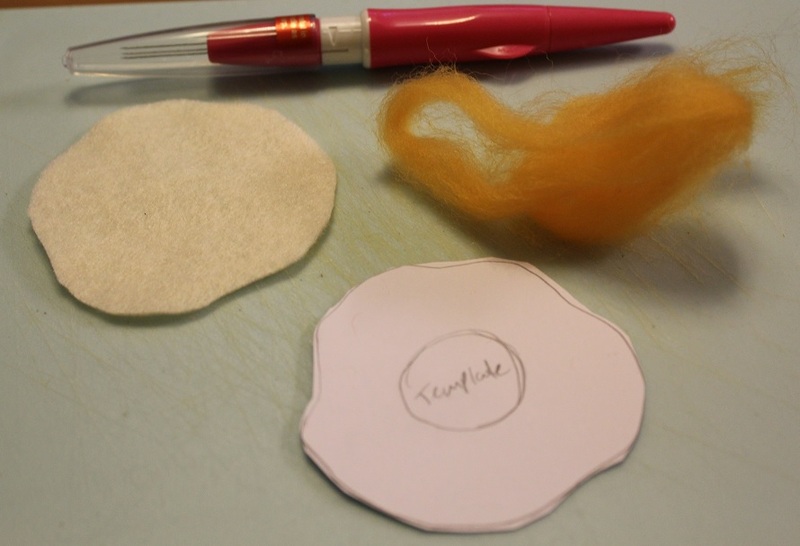 I’m extremely happy with how they came out and this post is about how the project came together (step by step) for anyone else who would like to make their own felt play food. 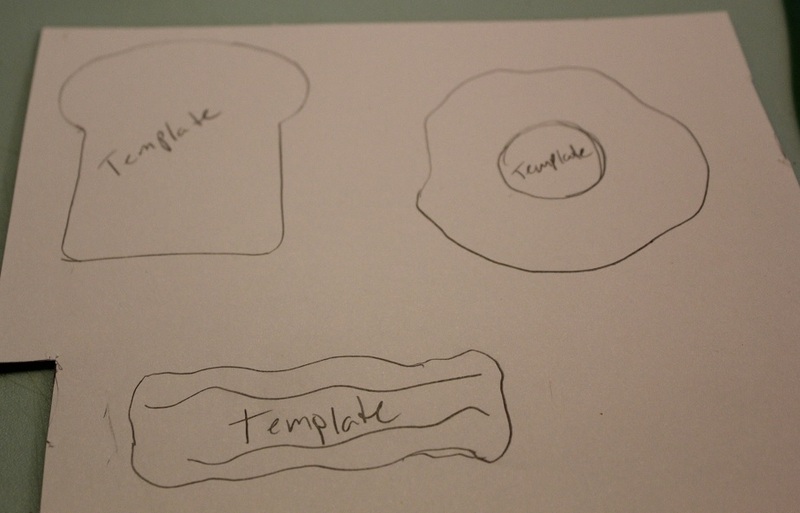 First I made pattern templates for the food. I used a piece of plastic bread to trace for the bread template and I used the base of her frying pan as a guide for how large to make the eggs and bacon because I wanted them to actually be able to fit inside of it. Next I cut out the shapes from the templates and started on the egg. I had pure white felt as well as cream felt but I decided that the pure white, though maybe more realistic, ended up looking too fake once assembled and so I went with the cream. 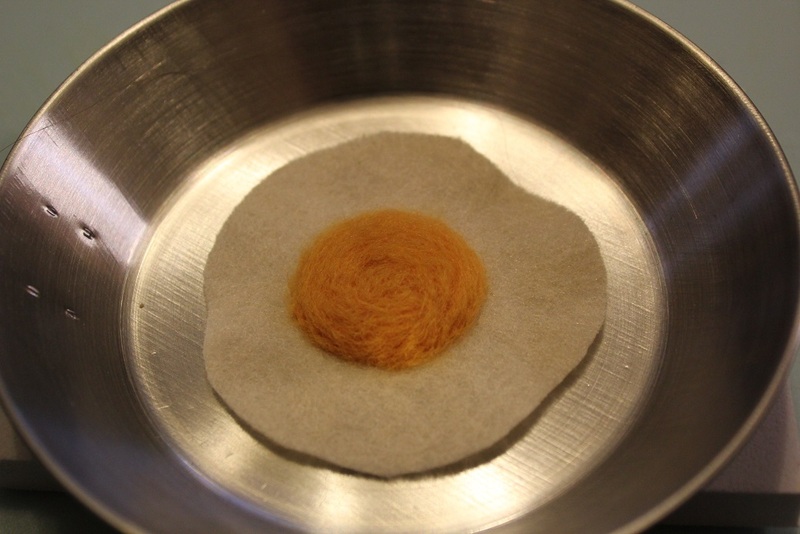 I picked off a bit of my yellow wool and formed it into a loose ball in between my hands then put it on top of the egg base. 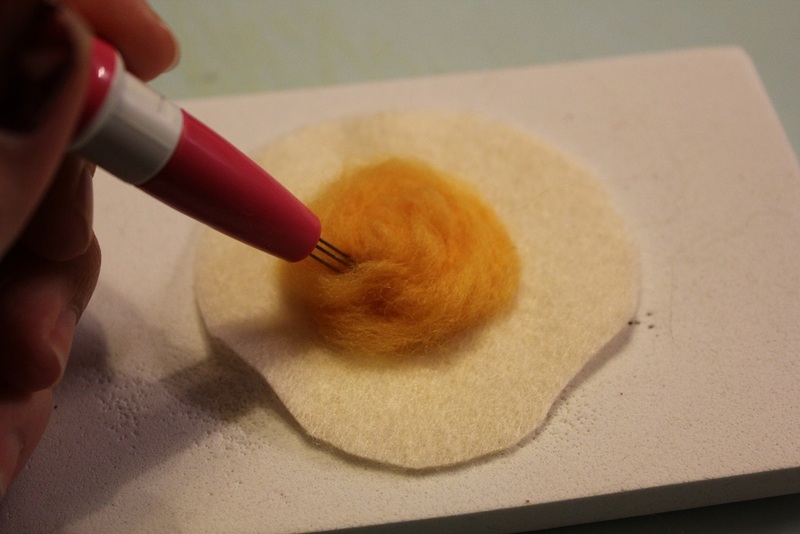 Using my felting needles I stabbed it into a yolk shape. I have two felting needles. One is a single and one is a triple. I used both for this project as the triple gets big jobs done more quickly but the single can’t be beat for precision and sculpting. The needles are roughly between a 38 and 40 gauge but since the packages didn’t exactly specify I can’t be sure. One came with a felting craft set and the other was a Christmas gift. Here is an egg finished. It fits perfectly in the little Ikea frying pan. Next I tackled the toast. 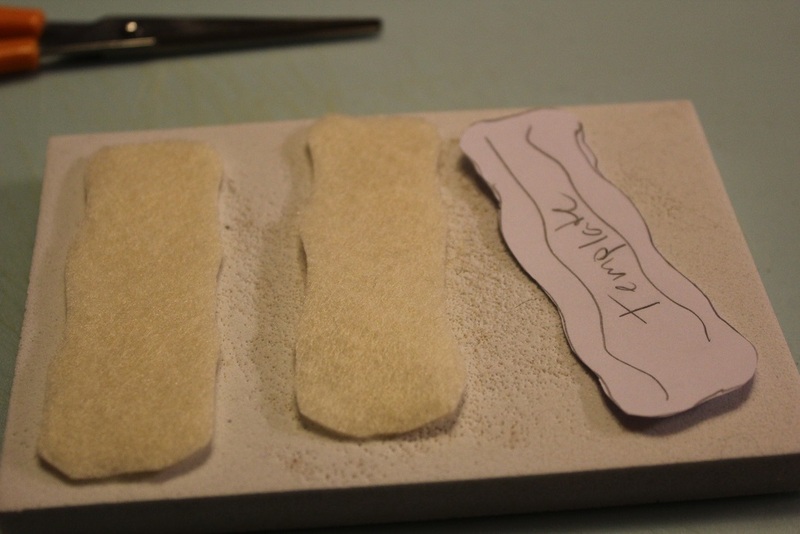 To make the toast I doubled the felt because I wanted it to be thicker than the floppy egg so I just cut two shapes from the template and laid one on top of the other. 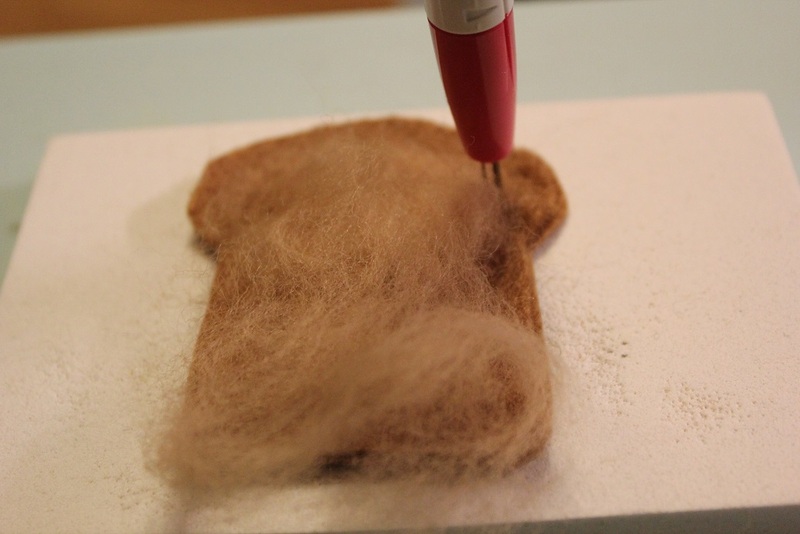 I then laid the wool which was a lighter shade of brown on top of the two toast shapes so that I could define the crust. 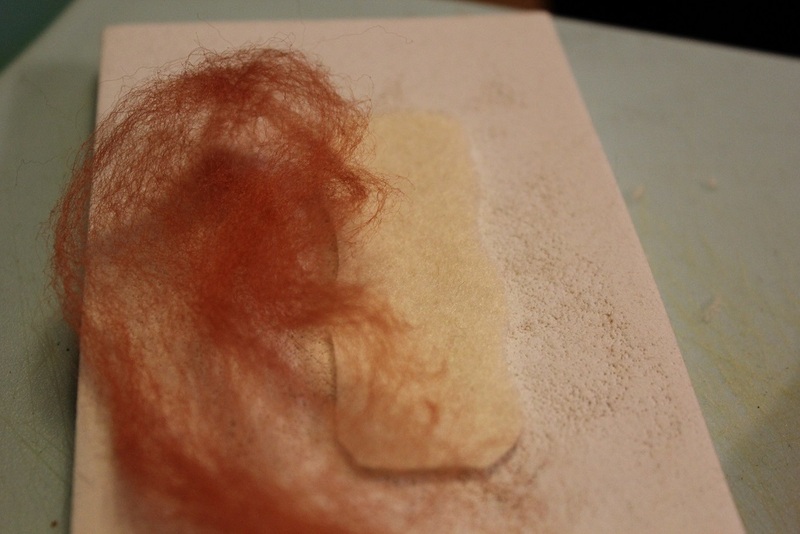 I suppose I could have done this in reverse if I had had darker brown but these are the materials that I had to hand. 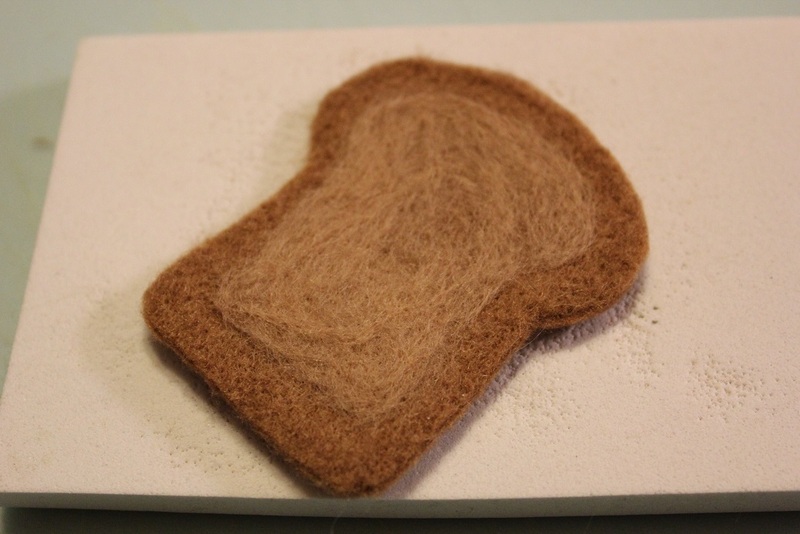 To define the crust I just felted the wool onto the toast shapes leaving an outline around the edge. 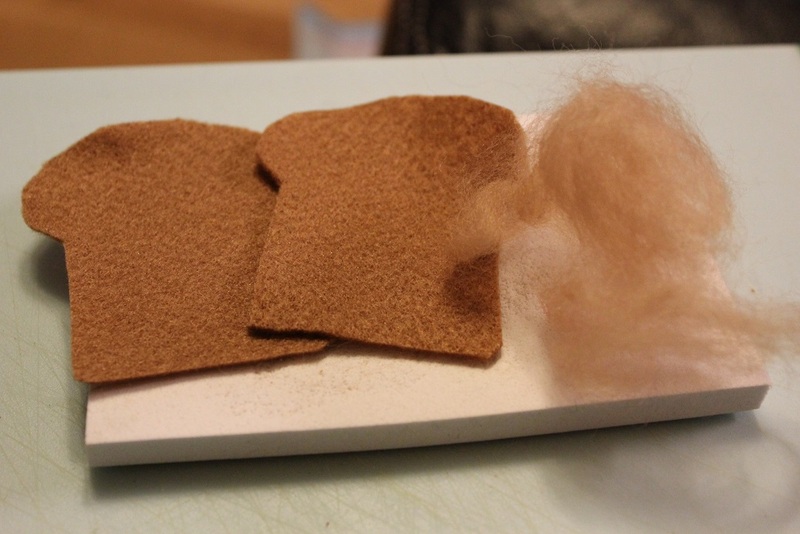 I then stabbed the crust all the way around repeatedly to join the two pieces of felt. To make the edges very securely joined I used the single needle at the very perimeter. The last thing that I wanted to make for this little trial set was some bacon. Bacon proved to be the most challenging thing to create and I went through a couple of thought processes (felting disasters) before I came to my final draft. I admit, it’s not the greatest looking bacon ever but it serves its purpose. 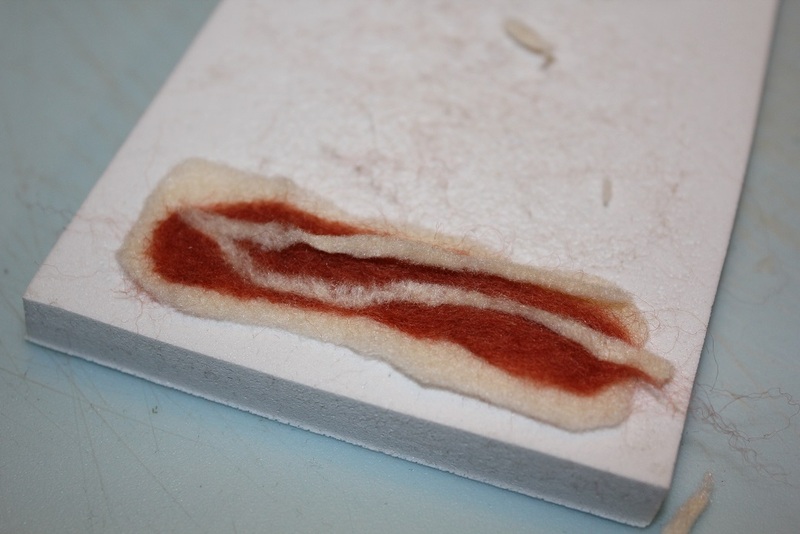 Since I didn’t have bacon colored felt I had to use the cream color which happens to also be a good fat color, and I felted on some bacon colored wool. After the wobbly bacon design was applied I felted on some fat stripes. I used thin cut pieces of felt for this but wool would have been MUCH better for the job because the wool is in strands an dthe felt just chops up into fluff. Unfortunately I didn’t have any cream colored wool and pure white looked incorrect so this is what I did with the materials that I had available. 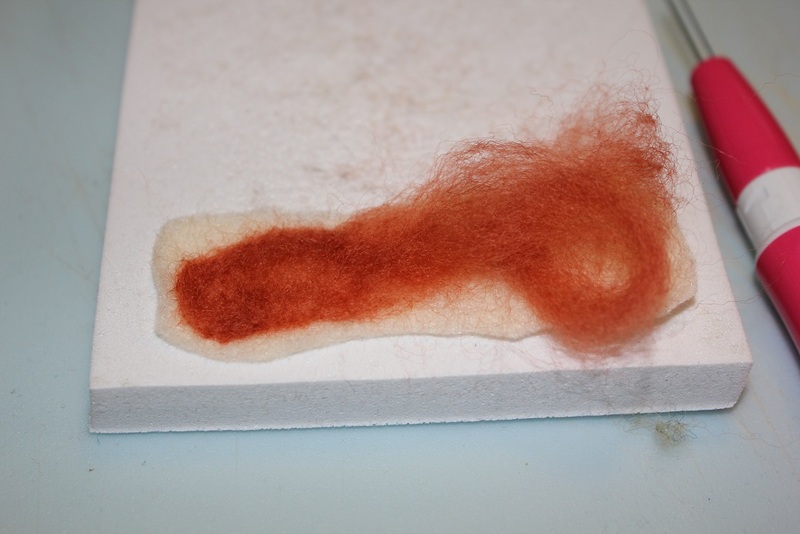 If you have cream colored wool and bacon colored felt, I suggest that you do the reverse of what I did. So that’s pretty much it for the breakfast set. My little girl is crazy about it and I’ve already ordered more felt so that I can get the other ideas that have been brewing in my mind out of my head and into existence. Stay tuned!